Please accept our humble obeisances from the WVA-VVRS' Internet Committee. 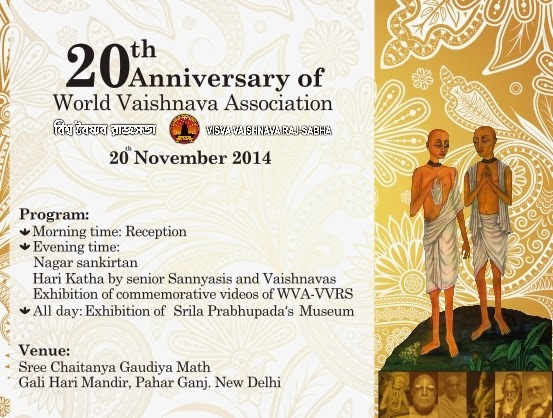 We invite you for a whole day celebration for the memorial occasion of the 20th year of the World Vaishnava Association - Vishva Vaishnava Raj Sabha that will be held in Delhi on the 20th of November, at the Gaudiya Math in Pahar Ganj. There will be a big Nagar Sankirtan and Hari-katha by all missions. In order to pay a tribute to our Parampara we suggest every mission to bring a banner of your Gurudeva to be honored as well on this occasion. Please join us on this day. Please join us on this special celebration.